Over the past few days I have taught you how to build your online course, where to get ideas for creating your course, and why you should create it. 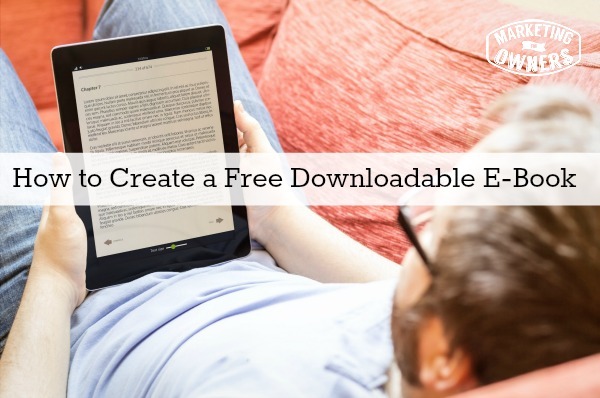 But what if you wanted to offer a free downloadable e-book? There are two types of e-books that we’re going to discuss. There are many out there, but really there are just two basic concepts. One is the short-form e-book. A short form e-book is one that will be about 25-40 pages long and what you will use for a lead magnet for a free giveaway to get people on to the list. You use it to get their permission. In this short form e-book, you will include images, a nice typeface, et cetera. You will add some text and make it look very professional — but short and to the point. The second type of e-book we are going to talk about is the paid version. If what you have to offer is of real value, then you will want to make this one longer, perhaps 145 pages or so. A lot of people give away big e-books. I personally don’t recommend giving away something of that size because to be honest, when it’s free, people don’t get the value. They haven’t paid any money so they’re not desperate. An e-book this size that you got for free will make you want to take your time reading it. Therefore in your spare time, you might decide to print it out. That’s going to get through your ink cartridges, blow up your printer, whatever; you’re going to be annoyed. Then, you just may not get around to it. If it’s an e-book that you’ve paid for, it’s going to be different. What Will I Need to Create an e-book? Obviously, the first thing you will need is a computer and of course, the Internet. To help cut the costs of your e-book, be sure and write it in Word if you are using a PC, or if you’re using a Mac, write it in Pages or write it with Google Docs. Then add images. If you do use Pages on a Mac, you can format it into a beautiful-looking e-book without having to outsource. But you can still outsource it. Write it, put in your images, add in your links, and simply save that and when you go to print it, be sure to do it as a PDF. That saves it into a pdf. Now if you want it into anything fancy, that might have a secret code so that people cannot change the wording on you, use Fiverr. They do a great job and it only costs $5 to do it. Trust me. Just try it. If you want to do a longer e-book, you basically follow the same pattern. Now that you have it finished and saved as a PDF — how are you going to deliver it? Our favorite way is through Dropbox. If you don’t know what Dropbox is, go to marketingforowners.com/tools and there’s a link to Dropbox. I think it gives a pretty good explanation. Just use the free version of Dropbox. You can deliver stuff and store your work online. You just give your customer a link, and it will be delivered to them via email. They’ll download it on any device and they’ll be able to read it. Either the long on or the short one; it doesn’t matter. The best way to deliver the e-book to them is through an email service like AWeber, MailChimp, InfusionSoft, or Constant Contact. Now personally I only use MailChimp and AWeber and I strongly recommend AWeber. I’ve used it for a lot longer than MailChimp. It’s brilliant. At the moment, I think they do a free trial. They certainly do a one dollar trial so you can dive in and try it. They’ve got loads of tutorials. But the reason you need an email auto-responder is because first of all, you can’t do this manually. You need to set it up so when someone requests to get your e-book, they will fill out a form. In other words, they put their name and their email in a form that will automatically send them a welcome email that has the download link in it. It will be delivered automatically to them during all hours of the day. It’s automated and we’re all about automation. If your e-book becomes very popular and you start sending them out from your regular gmail email account, you will be delivering a lot of emails and you will be flagged by ISP’s as a spammer. People that send out a lot of emails, those addresses are monitored. They pay attention to those that have links in them and when they have certain things that trigger, you will just go into spam and you won’t be able to get out of it. You won’t even know it’s happening. People won’t get your emails. They don’t care, they don’t look in spam. Don’t do it. Just don’t do it, please. It’s not going to make any difference to me. Just go to AWeber, try it. They provide the forms, newsletter templates and more. You got to be doing a newsletter and everything else anyway. You can do all of that from the same account by the way. You pay for how many emails are in there so it gradually builds up. It’s starts at a price. Once you go over a thousand or two thousand or five thousand, the price just goes up. So you don’t pay too much. Now, I can tell that some of you don’t want to write. Remember the old adage that says if you wanted to tell someone how to do something, there are three stages; tell them what you’re going to tell them, tell them, and tell them what you’ve told them. That’s it. So in other words, introduce and explain what you’re going to do. Explain all about it, tell them everything you know and then summarize what you just told them. Be sure to introduce yourself, explain who you are so they can get the trust and get to like you. You want to give them examples. You want to tell them your story. Tell them how did you figure this out? What couldn’t you do? What was the problem you had that created this? Yes, you’re problem-solving. You’re problem-solving for them and you probably did it for yourself. Who else do you know that had the same problem? How did they discover this? Who have you shown this to? Who’s told you it was wonderful and they got this result from it? Build up the introduction. Now tell them everything. How many chapters do you want? Say if it’s the short form, how about seven chapters if you’re going to use chapters at all? An introduction to the system. An introduction to you. That’s two, then three, four, five, six; four chapters on it and then the last one, seven, the summary. The summary can say – for a better, detailed explanation, go to and that’s where you will sell them if you’ve got something to sell or just tell them you’ll give them more information over a period. What is the difference between the short form free e-book, and the longer paid e-book? Let’s use emails for example. We just talked about MailChimp and Aweber. So — for the shorter free version, you can explain in a shorter summary what these do and how they are used. Now in the paid version which is three or four times longer, you can go into more details. You can talk about it being your favorite tool, how to sign up, how to log in. You can create lists with examples with screenshots. Show them in a form what to do and what not to do. Give them their money’s worth. These types of e-books are full of detail. That’s what it’s all about. That’s the difference. Free is a summary. Paid is the real meat. Tell them everything. If you can’t write, jot down the bullets of what you know and by each bullet a little summary, then get online, hire a writer to fluff that out. When it comes back, read it. If you don’t like it, get them to beef it up a bit. Read it again. Then send it to a proofreader. You can get all these on Fiverr. Don’t give any excuses. Can you not add your images in? Get a report designer, a graphic designer, give them the text, give them the images and say “Please create that.” Seriously, there are no excuses. Even I can do this and I do not design my own. I haven’t got time. Why would I when I can get it done for a few dollars, fifty dollars, something like that? Why would I? Anyway, it’s easier than you think. Please give it a go. Today’s friendly follow is Barry Moltz. 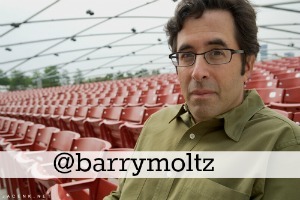 You can find him on Twitter as @barrymoltz. Barry has been around. He explains he’s started loads of small businesses and sold them and he’s failed a gazillion times in the last 20 years. He’s written books. By the way, people who’ve failed are better to learn from because that’s when you learn what not to do. He’s been on TV. He is in the Entrepreneurship hall of Fame. That made me laugh when I saw that because I’ve never heard of it. Hey, it sounds good and Barry’s in it! He really is good by the way. His thing is teaching people how to unlock their long-forgotten potential. Please go visit him. What kind of e-book would you create?